Similarly, Ring Road works were started in December 2005 and the project was culminated during the YSR regime. SRIKAKULAM: Opposition Leader YS Jagan Mohan Reddy has promised to formulate an Act to provide 75 per cent reservation to local people in private companies and industries in the State if YSRC is elected to power. Speaking at a public meeting at Chilakapalem junction in Etcherla mandal on Thursday, he said soon after coming to power, his government would conduct a “mega DSC” to fill up vacant teacher posts in the State. He also came down heavily on Chief Minister N Chandrababu Naidu and other TDP leaders. Terming Naidu ‘pittala dora’, Jagan said that the TDP chief was breaking the world record in lying. “The Chief Minister is in Telangana now for his personal gains, forgetting the interests of the State,” he alleged. Reacting to Naidu calling his MLAs who switched loyalties to other parties as cheaters, liars and backstabbers, Jagan said the TDP chief had done the same thing in Andhra Pradesh. “Naidu bought 23 MLAs from the opposition party. He even made four of them ministers,” the YSRC chief said. “Various cooperative societies, including cooperative spinning mills, were shut down by Naidu. For the interests of his Heritage company, he closed down a government dairy unit in Chittoor. 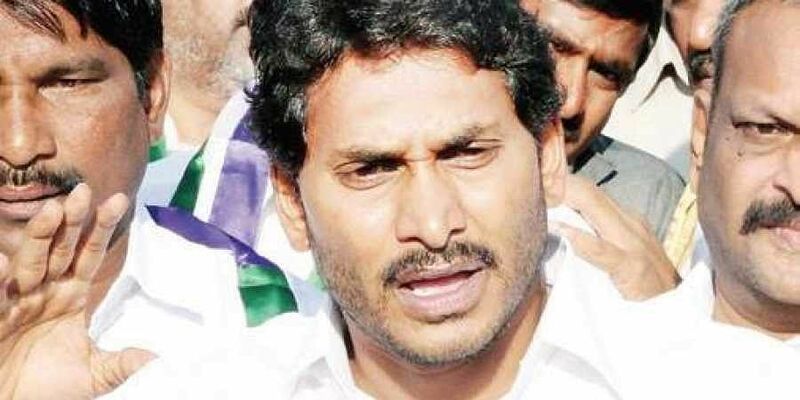 He also sold off about 54 companies to his benamis and other business magnets,” Jagan alleged. Jagan did not even leave local MLA and Andhra Pradesh TDP chief Kala Venakta Rao. He termed Kala as Kakala Venkata Rao who, he said, acted as a broker in purchasing YSRC MLAs. The YSRC chief also alleged that Kala’s close associates bagged about `30 crore as compensation by creating fake land documents in connection with Kovvada nuclear power plant. In the name of establishing industry, Kala’s son bagged precious land at Naruva at a cost of `2 lakh per acre, he alleged. He also said that the works of Shamshabad airport commenced in March 2005 and were completed by 2008 during the RSR regime. Similarly, Ring Road works were started in December 2005 and the project was culminated during the YSR regime. Information and Public Relations Minister Kalava Srinivasulu described Jana Sena Party chief Pawan Kalyan as a person with no stability. “Kalyan makes a statement in the morning and forgets it by the night. He said he would fight for the special category status (SCS) in New Delhi, but didn’t keep up his word. Similarly, he said he would support anybody who fights for the SCS and lead them. He didn’t do that as well,” he said, speaking at ‘Grama Darsini’ programme held in Dharmavaram mandal of Anantapur district on Thursday. Firing salvos at Pawan Kalyan for criticising Opposition leader YS Jagan Mohan Reddy, YSRC MLA Adimulapu Suresh has questioned the Jana Sena chief for remaining mum over the alleged corrupt practices of the TDP government. “Pawan Kalyan, who helped TDP in the 2014 polls, is also responsible for the corrupt governance of Chandrababu Naidu. He never questioned the TDP even when it resorted to undemocratic ways of purchasing other party MLAs,” he said in a press meet in Vijayawada on Thursday.